You ever have one of those Saturday nights, where it’s after midnight and it’s right before you’re about to go to bed, and then suddenly a random wave of hunger kicks in? That’s basically what happened to me last night. There’s no medical explanation for it, nor were there any “recreational materials” involved in this process, which is surprising considering I ordered Domino’s Pizza at 12:30am. I like to make a big spectacle out of ordering delivery pizza. Look, I am a 30-year-old, married, grown-up man. I’m no longer in my late teens/early twenties, where ordering pizza after midnight is a weekly occurrence. 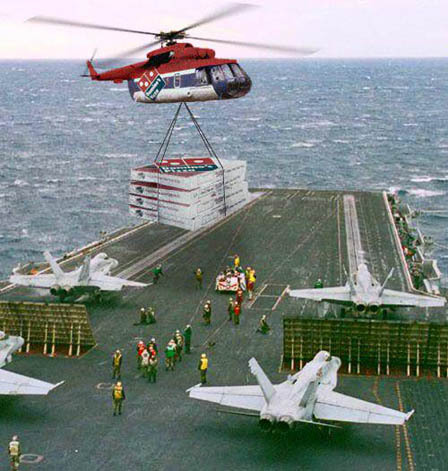 I can’t even tell you this last time I ordered a pizza to be delivered after 8pm. However, after going through every morsel of food in the fridge, freezer and pantry last night, nothing felt like it would satiate me. Then after ruling out a random trip to 7-11 for terrible taquitos, it dawned on me – pizza delivery! All of a sudden, life started to make sense again. This decision was going to help me regain my collegiate youth, turning me back into a 20-year old, who could stay up all night, eating pizza, drinking beer and watching movies. For the record, I fell asleep about 10 minutes after eating half a medium pie, drinking bottled water and I can’t remember what movie was on. As we looked over the menu, there were definitely many words that I would not have otherwise recognized if not for Top Chef. Words such as yuzu, cavatelli, ganache and carrot were now more familiar, but there were still several which were foreign to me. Thankfully Carlo was there again to provide all of us with any answers and descriptions of the plate. In the strangest, yet one of the funniest moment of the evening, when asked what beef coulotte meant, Carlo turned to the side, and grabbed what appeared to be the area between his backside and thigh. Needless to say, two of the ladies ordered the beef coulotte as one of their courses. For me though, I opted to diversify my palate portfolio as much as possible. I chose to go with the 3-course menu, instead of the 4-course menu. Since I do not have much of a sweet tooth, I did not feel compelled to have dessert, plus I knew that I could always try a bite of Maggie’s as a fallback option. The first course offered a variety of selections, ranging from all different types of foods. I ordered the potato-leek chowder with applewood smoked bacon and sea scallop. Unfortunately, I suppose to it being so late, the kitchen was out of scallops and instead the chef offered to replace it with several fresh prawns. If I was searching for any reason to be negative for the overall experience, this would be as close as I could get, however, the honesty was appreciated and the substitution was suitable enough – although a scallop would have probably gone and tasted better with the chowder. Five of us got the potato leek chowder, and Maggie was the rebel who tried something different. She ordered the yellowfin tuna, which was served over jasmine rice, with sesame lavash, yuzu vinagrette and drizzled with chili oil. After her first bite, she was grinning ear to ear, and was ready to declare herself Mrs. Voltaggio. 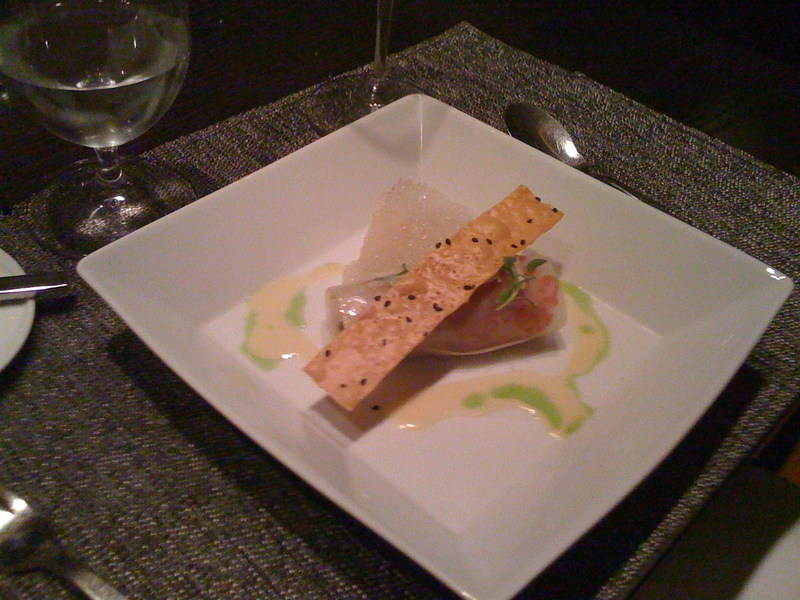 Thankfully I got to try a piece, and the tuna just was so fresh, it practically melted in your mouth like one of those Listerine strips (yes that’s a horrible analogy, I just compared an expensive piece of amazing tuna to small piece of paper). The serving of the food itself also warrants mentioning, with the six of seated for each course they brought in three servers carrying two dish apiece which were placed in front of the respective person simultaneously. It was very refreshing to have all six of us served at the same time, instead of having to endure the situation where someone doesn’t get their food with everyone else, and you just sit around awkwardly, hoping your food doesn’t get cold. For the second course, I went with a border springs farm lamb shoulder, which was mixed along with cavatelli pasta (look like baby earthworms almost, and I believe it is made with ricotta cheese in the dough, but not entirely certain on that). There were also oyster mushrooms, scallions and thyme in the dish as well. This was a fantastic choice. Every bite offered something different. From the tenderness of the lamb shoulder, to the thickness of the fresh cavatelli, and the lemon burst of the thyme, the combination of the flavors worked to perfection. Even the scallions, which I’m normally not a big fan of, had a great taste to them. And again, the service was timely, the wait in between courses was not long enough to bring you hunger pangs, and it wasn’t short enough to where you were still tasting your first course. As we waited for the third course, this was a great time to get to know more about Volt, and once again Carlo was very nice to take time and converse with us. It was the exact opposite of the “restaurant wars” episode of Top Chef this past season when Laurene was sent home for being a terrible, uninformed, often missing, front-of-house. Carlo was the exact opposite. He was out-going, entertaining, spoke with passion about the food, the restaurant, and how he came to work at Volt. He never seemed bothered by us asking him many questions; he just truly appeared to love what he does and where he works, and in turn, I think that reflects onto the customer and helps us approach the meal in a positive manner. Also, he had a great sense of humor. In the funniest moment of the night, I went to thank him for all his work and help, I thought his name all along was Carlos, so when he corrected me, I apologized and said that I have a habit of pluralizing everything. All of us, including Carlo, busted out laughing from that, and definitely continued to set a positive tone for the evening. When the third course arrived, I could not wait to try it. I debated between the pork tenderloin and the wellington farms chicken – the beef coulotte was eliminated from the decisions earlier thanks to Carlo’s description. I went with the chicken with the deciding factor being what it was served with. It came with a forest mushroom risotto with arugula and chioggia beets. I had no idea what chioggia means, and I did not ask, so instead I called them my Robert Loggia beets. The chicken itself was three large roasted boneless pieces that you knew were going to each be tender and flavorful just tell by looking at them. Two of the three pieces were from the breast and the third piece was a specially prepared part of the thigh, which I unfortunately have since forgotten how it was prepared, but that was easily the best tasting part of the chicken. The risotto was the perfect compliment as well and while it’s hard to get bad risotto in a nice restaurant, this may have been the best risotto I’ve ever tasted, partially in thanks to the forest mushrooms and the arugula that was mixed in with each bite. As for the Robert Loggia beets, I could not tell you the last time I ate beets, probably sometime at my grandmother’s house when I was a kid, but I am ready to rejoin the beet nation after tasting those. Also, after drinking still water with my first two courses, I chose to pair my third course with a glass of New Zealand’s Grove Mill sauvignon blanc, which was a great choice to go alongside the chicken. I should mention that Maggie, went with the additional wine pairing for each of her three courses, and remarked how much she loved each one as an excellent compliment to the courses themselves. In lieu of the dessert, I ordered the cheese course from their artisan creameries. 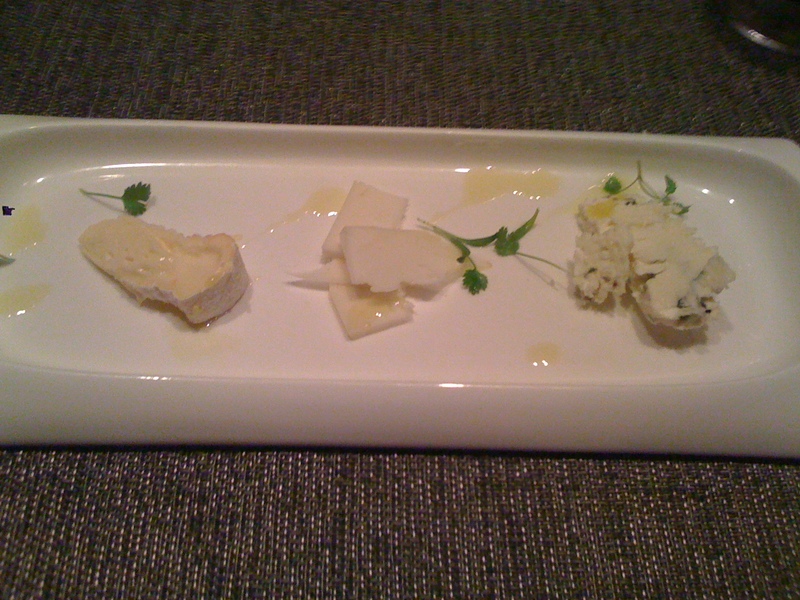 It was a delicious tasting of three separate cheeses, which I will do no justice in describing. The first was similar to the texture and look of brie, but not as negatively overwhelmingly strong as I find most brie cheese to be. The second, which was easily my favorite, was similar to goat cheese, but with a stronger texture, and the third was a bleu cheese-esque, with a very strong tangy bite to it. Since I am not the world’s biggest fan of bleu cheese (even though this was tasty), I traded my cheese to Maggie for a bite of her passion fruit ice cream, which was heavenly. If that all wasn’t enough, they hand select their coffee beans and press their own there as well. I ordered the Highlander Grog coffee, which can only best be described from their own menu, “combines decadent, buttery cream with delicious hazelnuts and then tops it all off with a generous splash of rich, spiced rum.” If that wasn’t enough, it also offered an aroma of caramel, which happens to be one of my weaknesses. Plus, Carlo came in and brought us each a sample mini-ice cream sandwich, courtesy of the pastry chef. Basically it was a dollop of perfectly temperatured ice cream, that did not melt, between two fresh cookies about the size of a quarter. As the last morsel of food I ate that evening, I could not have been more satisfied. By the time we finished, we were definitely the last table still in the restaurant, and part of me didn’t want to leave, or at the very least, get a room at a hotel or inn nearby so I could come back the next day for lunch. On our way out, Carlo came back in and gave us each wrapped complimentary freshly-baked banana nut muffins to have the next morning (which I’m proud to say were equally delicious compared to everything else). Also, I had asked Carlo since it was the last day of restaurant week if we could take one of the menus home with us as a souvenir, to which he obliged. Maggie had the great idea of getting them signed by Bryan, which he did as well, one for each of the couples. 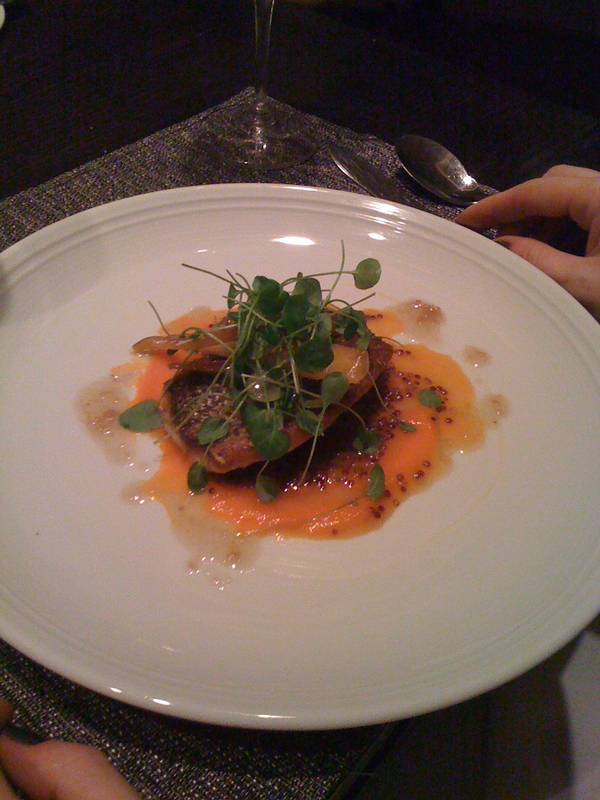 While it was midnight when we finally said goodbye to Volt and to Frederick, Maryland, the 50-minute drive home flew right on by as all we could do is talk about how that was possibly one of the best dining experiences we’ve ever had and how each course and each aspects of those courses were an execution of excellence. 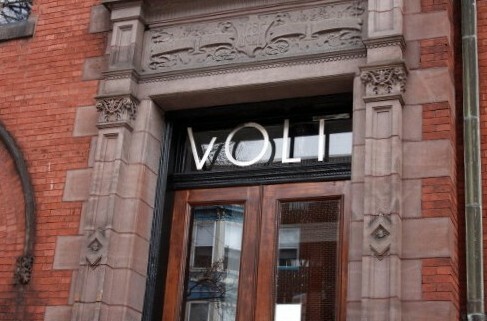 I can not wait to return to the city of Frederick and especially to Volt. If you live within driving distance, it is worth your time and you owe it to your tastebuds to try it. This past season though, was by far and away my favorite. Not just because it was held in Las Vegas, the city where I got married and made a fool of myself (completely separate occasions), but because for the first time, they had a pair of siblings competing against one another. The dynamic of the two brothers, Bryan and Michael Voltaggio, could not have made for better reality television, especially given their polar opposite personalities. Whereas Bryan was more calm, quiet and was classically trained, Michael was loud, brash, confrontational with a more modern training. They bickered on the show, they fought and worked hard to be the best and (SPOILER ALERT! )…when all was said and done, they were the two best, as Michael was named Top Chef and Bryan finished second. You could even call their sibling rivalry the 2Pac/Biggie battle of the culinary industry. With Michael out in Los Angeles doing his west coast thing, while Bryan, the older of the two, owning his own restaurant in his hometown of Frederick, Maryland, some 3,000 miles and on the opposite coast of his baby brother. Last night, I had the opportunity to finally try the food and dining experience of Bryan’s restaurant, Volt. I say finally, because the reservation was made over a month ago and this was the first available time we were able to get in our party of six. Plus, it was the end of DC’s Restaurant Week, (Volt is the only restaurant in Frederick that participates in it at the same time), so we would have a fixed menu, but of course at a lower cost than normal. Oh, and the reservation wasn’t until 9pm on a Sunday night! Kind of reminds me of the Ghostbusters firehouse. None of that mattered though, the reservation could have been for 3am and it still couldn’t have been a better dining experience! Volt is not a large place, but it’s situated in the heart of downtown Frederick. I have never been to that part of town and was amazed by how simple it was, and I mean that in the most positive way possible. There were no big chain stores or flashy new construction, every place were little mom-and-pop specialty stores with most of the original architecture still in place. Definitely a place that warrants checking out during daylight hours to fully appreciate its subtle beauty. The restaurant itself is very interesting, it’s situated on the main level of its building, with an art gallery in the basement and a graphic design studio above them. The interior definitely has a modern feel to it, but it’s nothing overly aggressive or distracting. Not much fancy artwork adorning the walls and even most of the waitstaff were dressed in a “business casual” type of style with my personal favorite of most of them wearing Chuck Taylor’s Converse sneakers. We arrived shortly before 9, and hung out in the bar area while we waited for our table. My biggest concern from reading online reviews prior to arriving was that many people, while they enjoyed the food, were negative towards the waiting that they had to endure, both for their table and their food. So when 9:15 rolled around, and we were still standing in the bar area, I had a bit of trepidation for the rest of the night. Here we were, late on a Sunday night, probably the last reservation of the night, and at the end of a busy Restaurant Week, so it was beginning to feel like it could be a rough first experience. Not two seconds after the thought crossed my mind, in walked Bryan V. himself delivering food to the bar. This made me feel at ease, not just because it was really cool to get to see him up close after watching him on TV for months, but the see the owner of his own restaurant, running around with his apron on, looking really busy. Honestly, I would not have been surprised, given his recent fame that he would either not be there, or just hide away in the kitchen or his office. So it was another pleasant surprise to see him out and about. Also, the restaurant isn’t very large, maybe 20-25 tables upon a quick glance, so I began to understand the wait. Less tables usually means a slower turnover. However, when we were finally escorted to our table, not only were we being seated, but we were being sat in a special room separate from the rest of the dining room, a room that has only one table in it, just for us! The entry to the room was a giant glass wall and door, so when everyone walked by they could look in at us and think we were special. My friend Eoin said it best, that it was fairly reminiscent to the smoker’s lounge at an airport. Except that no one pitied us or judged us as they walked by. It was definitely a great benefit to have this seclusion to ourselves though. We could be as loud as we wanted, and basically talk about anything without having to worry about anyone possibly being offended by us. Not only that, but we also had Carlo (plenty more on him in a bit), who was in charge of the front of the house, taking great care of us the whole night, walking us through not just the menu, but the history of the restaurant and the building itself. I’m not certain if he was taking care of any other tables outside our little “glass house,” but considering how often we saw him and how much he chatted with us, it felt like very personal service and it only added to the overall enjoyable experience.